Cocaine is derived from the coca plant leafs. Cocaine is a stimulant of the central nervous system that the affects the mesolimbic reward pathway. Because of the way it affects human’s body, cocaine is extremely addictive substance. In powder form, cocaine is known as coke, C, flake, blow, toot and snow. Cocaine is typically consumed orally, sniffed or injected to the veins. Crack cocaine, or simply crack, is a street name for cocaine administered by smoking. Crack is a fairly new drug with extremely strong effects that occur in 10 or 15 seconds after the consumption. Snorted cocaine effects usually develop after 15 minutes. Crack looks like small white crystal stones, while cocaine is a white powdery substance. Crack is in the purer form of cocaine and it is more addictive than the commonly used cocaine in powder form. Cocaine increases awareness, feelings of happiness and excitement, vigor and motor activity. Moreover, cocaine may elevate the feelings of competence and sexual desire. Athletes may enhance their performance, on cocaine, especially in the disciplines that require attention and endurance. 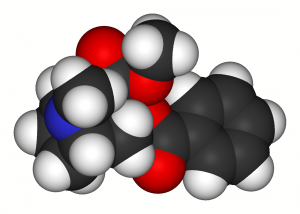 This highly intoxicating drug is very popular as a recreational drug in different social circles. Cocaine does elevate one’s emotional feelings but it is highly addictive and has serious side-effects. Various health problems are associated with cocaine abuse. The severity of side effects vary depending on the dosage one uses and the general health and age of the patient. The most prominent side effect recognized among the cocaine consumers is the emotional instability. Cocaine also has severe side-effects on the brain, as it interferes with normal chemical exchange that takes place in the brain. Cocaine leads to chemical in balance which may result in a series of highly unpleasant symptoms such as nausea, vomiting, mood swings, strong headaches, and restlessness. The person is usually destructive, nervous and bad-tempered. Cocaine affects the human heart, too, by increasing the heart rate and reducing the blood flowing to the heart. This obstruction leads to weakening of arterial walls and narrowing of the blood vessels. Total effect is the increase of person’s blood pressure and resulting higher risk of coronary diseases and especially heart attack. People addicted to cocaine, especially those who smoke crack, may have serious problems with respiratory system. These people usually suffer from chronic bronchitis, bleeding nose, accumulation of mucus and in some cases they may experience respiratory failure or growth of lung cancer. Cocaine is especially dangerous for pregnant women as it endangers the baby, too. Cocaine abuse is linked to still births and various physical and mental birth defects. what are the effects of taking Lexapro & snorting Cocaine? How does cocaine effect the heart?